Clive, Iowa – January 8, 2018 – Although a vast majority of Iowans have positive experiences with the healthcare system in Iowa, nearly one-in-five Iowa adults (18.8 percent) report having experienced a medical error either personally or with someone close to them where they were very familiar with the care that person received, during the past five years. This finding comes from a new Iowa survey released today by Heartland Health Research Institute of Clive, Iowa. The first of its kind in Iowa, this statewide survey was conducted from May 11 to June 6, 2017. A total of 1,010 Iowa adults age 18 and over took part. Of the 18.8% of Iowans who experienced an error, 60 percent were not told by the responsible healthcare provider that an error had occurred. The survey finds that hospitals are the most frequent site of medical errors (59 percent), while 30 percent of errors occurred in the doctor’s office or clinic, four percent in nursing homes and seven percent at some other location. The most common type of medical error cited by Iowans were mistakes made during a test, surgery or treatment (60 percent), while over half (55 percent) said the error was due to a misdiagnosis. Ninety percent of those experiencing a medical error, either personally or with someone close to them, believe the medical error was preventable. When experiencing a medical error, six-in-10 Iowans believe a serious health consequence resulted and nearly one-third reported that serious financial consequences had resulted from the medical mishap. 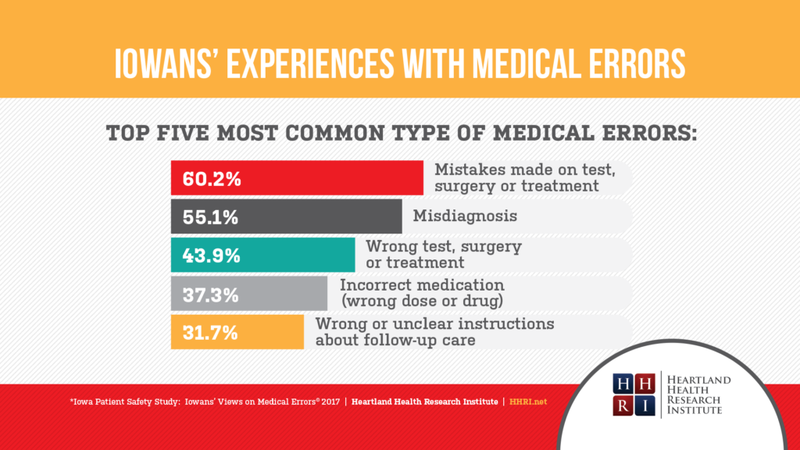 Sixty-two percent of those who experienced a medical error reported the error, while one-third did not report the error. Almost two-thirds of those who did not report said they simply didn’t think reporting the error would do any good. 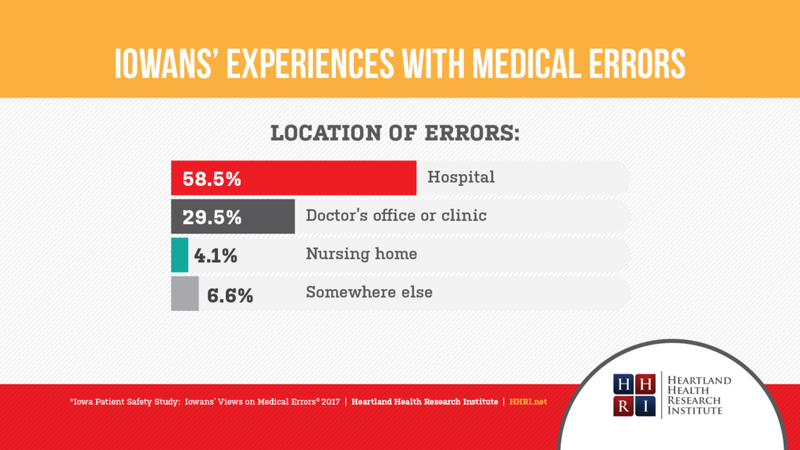 Almost nine-in-10 Iowans who reported the medical error did so because they wanted to prevent the same error from happening to someone else. Only 25 percent reported the error because they desired to receive compensation for the harm. 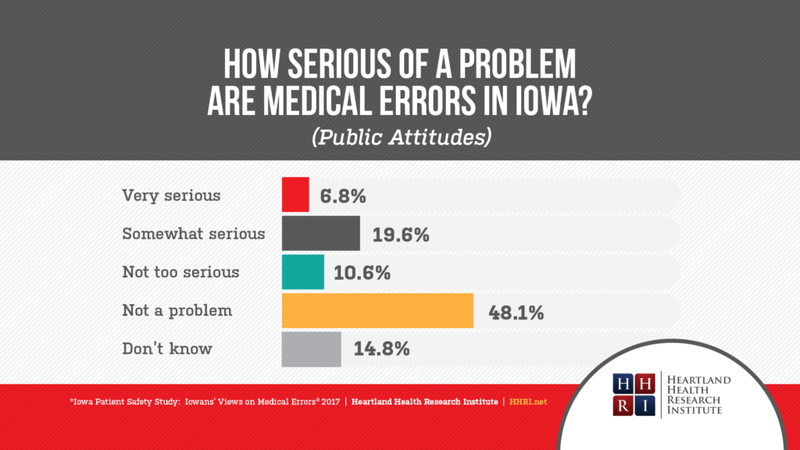 When asked if medical errors were a problem in Iowa, 26 percent of all Iowans surveyed believe medical errors are a “Very serious” or “Somewhat serious” problem, and 11 percent perceive medical errors to be “Not too serious.” Almost half believe that medical errors are not a problem. To assess perceived progress in eliminating medical errors during the past five years, about a quarter of Iowans (24 percent) believe there are fewer errors today than five years ago, whereas 18 percent believe there are more errors now. About one-third of Iowans (32 percent) felt the frequency of errors has not changed in five years. Many Iowans generally believe that a high percentage of medical errors can be prevented, and are primarily caused by overworked medical staff, lack of care coordination and poor communication. 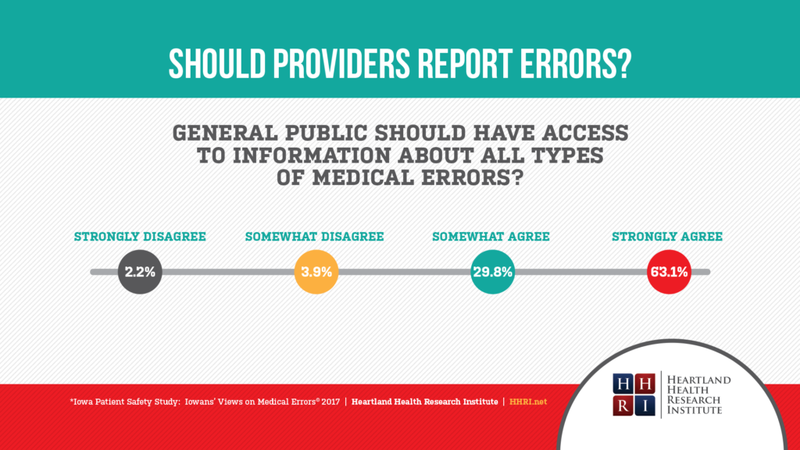 Ninety-three percent of Iowans at least somewhat agree the public should have access to medical error information for each hospital and doctor. 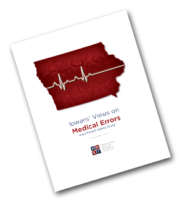 Eighty percent of Iowans “Strongly agree” that Iowa hospitals should be required to report all medical errors to a state agency, and 74 percent “Strongly agree” that Iowa doctors should be required to report all medical errors to a state agency. 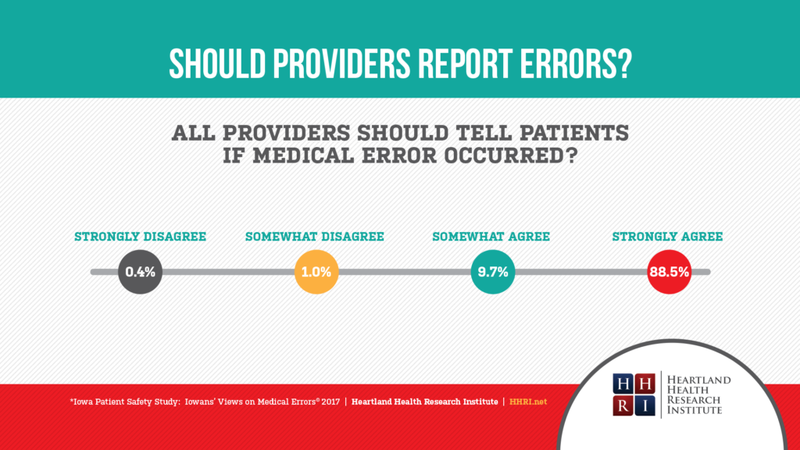 Nearly nine-of-10 Iowans “Strongly agree” that providers should be required to tell patients of any medical error. Sixty-one percent of Iowans who have not experienced a medical error are likely to believe their personal doctor would tell them if a medical error occurred, yet only 41 percent of Iowans with a medical error history believe this is true. The Iowa Patient Safety Study – Iowans’ Views on Medical Errors© was conducted from May 11 to June 6, 2017. Results are based on a representative sample of 1,010 Iowa adults age 18+. Interviews were completed using telephone-based data collection, with 451 completed interviews on numbers called using random digit dialing of landlines with Iowa’s area codes. In addition, 559 interviews were completed using cell phones. For the overall sample, the results are accurate to within plus or minus 3.1 percent, at a 95 percent confidence level. The study methods used permit the results to provide estimates of all Iowa adults. Data Point Research, Inc. (DPR) provided the interviewing, statistical analysis and mathematical basis for the study. Funding for this study came from David P. Lind, as President of Heartland Health Research Institute and was undertaken as a public service, with no financial, political, professional, personal or other bias inherent therein. A full report is available at HHRI.net. Heartland Health Research Institute (HHRI) is an independent, nonpartisan and nonprofit research organization based in Clive, Iowa. HHRI is organized as a public benefit 501(c)(3) corporation that conducts research and analysis on a broad spectrum of healthcare issues. Topics specifically focus on the patient’s perspective – measuring their confidence and trust in the healthcare system today and into the future. To learn more about HHRI, visit HHRI.net. About Data Point Research, Inc.
Data Point Research (DPR) is an independent full-service research organization dedicated to improving the lives of others. DPR provides precise, neutral, detailed, and easy-to-read analysis for clients. Founded in 1997, DPR collects, analyzes, and provides clients with the information needed to make solid, well-informed decisions in the areas of social policy, health, and employee benefits. Fascinating results, clearly presented. Another interesting, insightful, study by HHRI.